After being denied on two previous 14er weekend outings this year, I was determined to top out on our early June climb of Castle Peak with my regular partner, Patrick. We also wanted to tag the adjacent peak of Conundrum. While at a little over 14,000' it is not an official 14er since the connecting saddle was not 300' lower - details! I made the drive to Aspen and then 13 miles to the turn-off on the Forest Road where the official trailhead begins. FR102 is known as a tough 4WD road so I met Patrick near the turn off and we camped there Saturday night. Knowing that early June weather is quite variable in the Colorado Rockies, we set an annoyingly early wake up time of 3:00 AM. We wanted to avoid any post holing and deep mushy snow as the sun did it's work in the afternoon. After a quick breakfast we took Patrick's Four Runner up the road to the first creek crossing and then hiked another two miles along the road to the Montezuma Mine area. The road was mostly clear lower down but became increasingly snow packed as we gained altitude. At 12,000' it was completely packed as were the surrounding mountain slopes - a beautiful sight. We spotted a pair of tents in the Montezuma Basin but no other climbers. The sky was perfectly blue with only a small wisp of clouds - but that was about to change. We got our first glimpse of Castle hiding behind the smaller Malamute peak as we approached the headwall at 12,800'. At this point everything was covered in deep snow with a few tracks still visible from previous climbers. It was about then that we noticed a dark wall of clouds had moved over thus blocking out the sun. We climbed the short 500' headwall to the next basin where we got our first good look at Castle and Conundrum proper. It seemed like we still had a ways to go! About this time the campers had left their tents and caught up with us. The group of four 20 somethings were young, fit, strong and ambitious - albeit not exactly experienced. One of their group did not have crampons and retreated upon seeing the final summit climb. As he left his group, It started to snow and the wind picked up. Now standing at 13,600', we had a good view of the three routes to Castle's summit. We evaluated them taking into account the deteriorating weather. The weather forecast had shown a 30% chance of afternoon snow showers but there were no major fronts moving into the area so we knew it would be uncomfortable at best but hopefully not a drama. The normal route was on the Southeast ridge and the Southwest ridge in the summer but both looked a little corniced but still manageable. However the North Face Couloir spoke to us. It was about a 30 degrees angle that got steeper to 40 degrees near the summit ridge. The snow was firm and there were no signs of recent slips or slides. 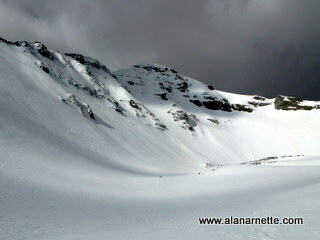 So with that we stashed our trekking poles and snowshoes at the base of the couloir and headed up. Our Chicago team was close behind and moving fast. Climbing this couloir brought back memories of Denali and Rainier with the sustained slope and steady repetition of rest steps and ice axe work. The wind was now blowing steady at maybe 15 mph and the snow was pelting us pretty good. 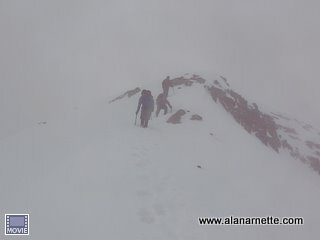 The young turks had now made it to the summit ridge but took a direct route over ice encrusted rock towards the summit. We continued our steady progress and gained the available ridge. I approached it carefully not knowing if it was a carefully disguised cornice laying in wait. But it was a three foot wide solid ridge with a steep slope on the other side - a perfect avenue to the top! We called over to the aspiring mountain goats to join us as we took our final few steps to the summit. But before we started I paused to ask them if they knew how to self arrest while looking over my shoulder at the south side 700' snow covered slope. The reply was a quick "no" and a blank stare so I gave them a 30 second lesson on using an ice axe that was probably more for my benefit than for them. And with that the weather got worse. I reached the summit and took the camera out to record Patrick's summit while watching the remaining two of the Chicago four following close behind. Once all were settled I looked around to see - well clouds - and snow! We took a few minutes to exchange names and congratulate one another and then took a quick retreat. The original plan was to take the Northwest ridge over to Conundrum but we could not even see the next peak much less feel safe about negotiating the ridge. So with Castle in our bag we left the way we came up. The down climb was slow and steady with all forms of techniques in use. Just as we reached the base, the squall passed by leaving us with an awesome view of the North Couloir and the summit of Castle. I felt good for our loose collation. Patrick and I had accomplished our goal and the Chicago team had performed quite well. The hike back to our camp was long as is usually the case after a 14er summit. We closed up our day with a quick pizza in Aspen before taking the long drive home. Castle Peak is a nice climb. I think I would enjoy it better as the true snow climb we did versus a summer one however since the normal route is north facing there is snow almost always on some section of the route. I am *told* the views are amazing of nearby Maroon Bells the other rest of the Elks but Mother Nature had the last word on that for our trip. I will probably return to grab the unofficial 14er, Conundrum, one day. But I would always enjoy another crack at Castle anytime of the year.